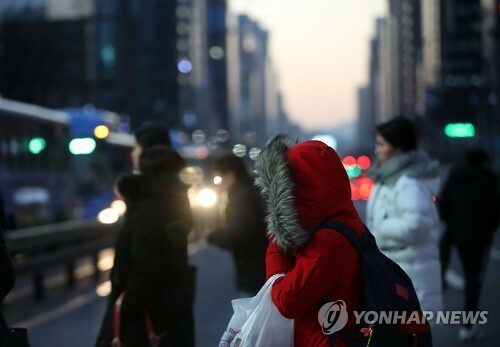 South Korea's electricity consumption has shot up to the highest in three months as temperatures dropped to the lowest so far this winter, the operator of the country's power market said Thursday. According to the state-run Korea Power Exchange (KPX), peak power demand reached around 79.2 million kilowatts (kW) on Wednesday, the highest since Aug. 25, mainly due to increased power consumption amid a drop in temperature. The country's reserve electricity stood at 11.3 million kW, with the electricity reserve ratio reaching 14.3 percent, also marking the lowest since 13.4 percent posted on Nov. 30, according to the operator. The widespread use of built-in fan heaters has caused electricity demand to spike in the past few days amid cold weather. In the past, power spikes usually occurred during the summer because ordinary people and workplaces turned on their air conditioners to stay cool. Earlier, the government expected this winter's electricity peak demand to reach 85.4 million kW, higher than last year's 82.97 million kW and this summer's peak of 85.18 million kW. In the meantime, it also said the power supply capacity will reach 99.43 million kW this winter, with the power reserve ratio standing at 16.4 percent.